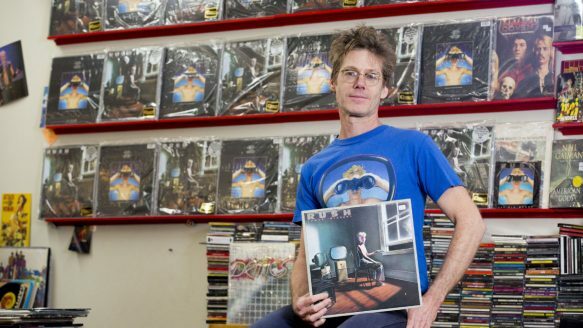 The boy from Rush's Power Windows is all grown up, and he's now stocking copies of the 1985 album at his own record shop. In fact, Neill Cunningham has assembled an entire wall of the records, just behind the counter at Toronto's Pandemonium Records, thanks to Rush's ongoing vinyl reissue campaign. Cunningham is the young boy on the front of Rush's concept album, bare-chested and wearing white pajama pants. Flip the cover over and he's pictured again, this time looking through a pair of binoculars. Cunningham's moment in the spotlight came courtesy of a friend who heard that photographer Dimo Safari (who was charged with creating the cover for Rush) was looking for a skinny blond-haired kid as a model. Cunningham was also featured in the music video for the album's lead single, "Big Money." the lead single from Power Windows. Later, he received a backstage pass to Rush's 1986 tour stop at the Maple Leaf Gardens, where he met the band for the first – and, so far, only – time.